Happy, happy Friday everyone! 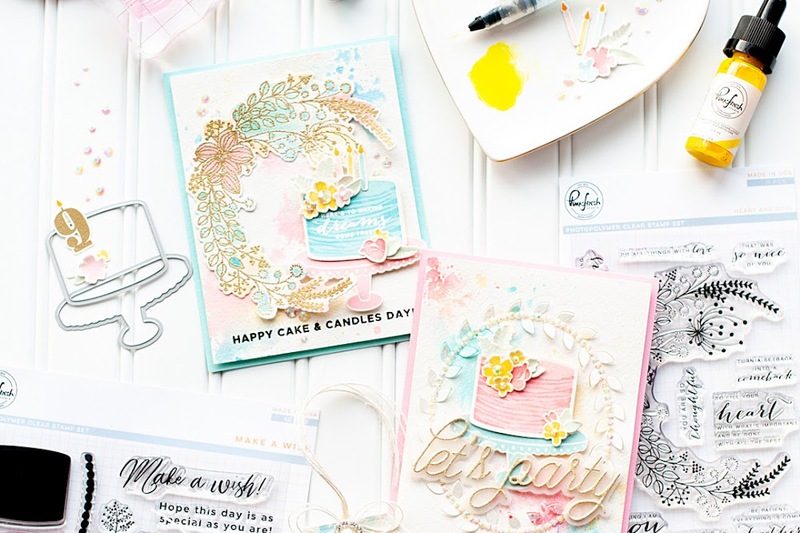 Today is my birthday, and I am SO excited that I get to share the day with you while celebrating the latest special issue from Paper Crafts magazine called "Color Inspiration for Card Makers". I have 15 cards in this special issue, and that makes it very special for me. I am so honored to be on the pages of this book, among some of the most amazing card designers in the industry...sometimes I have to pinch myself when I am looking through the book. So, for the blog hop today we were asked to use the color combo that is featured on the cover. In Bazzill Basics speak...the color combo is Great Lakes, Tink Pink, Lemon Lime & Lemon Drop. Here is the card that I created using FTL #122 from the Clean & Simple Stamping blog! Instructions: Fold pink dotted cardstock in half to make card base. Cut one large yellow paper block and two smaller green paper blocks. Adhere the two smaller blocks to the upper left and lower right corners of the yellow block. Add blue paper frill to each side of the block, and then adhere the entire piece to the front of the card. Adhere the yellow dotted flower to the lower right green block. Stamp the sentiment to a white cardstock strip, and cut a flag shape to the left side of it. Adhere the sentiment strip over a portion of the yellow flower, and then accent with pink & green paper flowers. Finish the card by accenting it with 4 colored jewels. If you haven't seen it already, here is the cover of the issue. Does the style look familiar to anyone?! Tee hee- that is MY card on the cover!! I was so excited when I found out about it! This special issue was so amazing to work on. I am so passionate about color, and I loved the challenge of using all these fabulous color combos. It was so fun to have my little Bazzill swatches in front of me, and then going through all of the different product that I own...making sure it matched perfectly, shade by shade. I really enjoyed the process, and I hope that one day Paper Crafts will decide to do another Color Inspiration issue because it was a really awesome experience. So, what is a blog hop without other blogs to hop to and prizes to win?! Well, it isn't one. Tee hee! So, be sure to check out these other fabulous contributors to the issue, as they are part of the blog hop too! But wait! 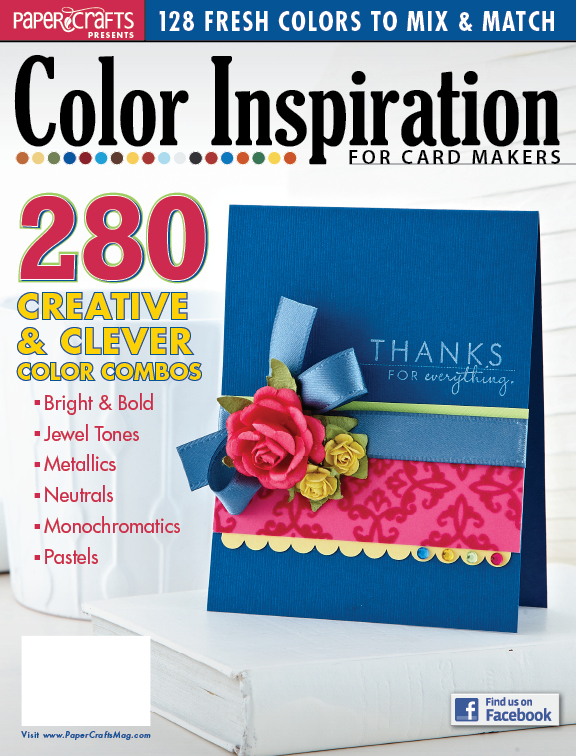 Don't leave my blog quite yet, because one lucky winning comment from each blog is going to get a free copy of "Color Inspiration for Card Makers"! While I believe the issue is worth EVERY penny, it is always fun to win things for free! So, make sure you leave me a comment by midnight on Sunday, January 16th in order to be eligible to win! I will announce the winner the next day in my Monday post. And be sure to visit and comment on all the other blogs as well...it will give you more chances to win! Umm...seriously?! 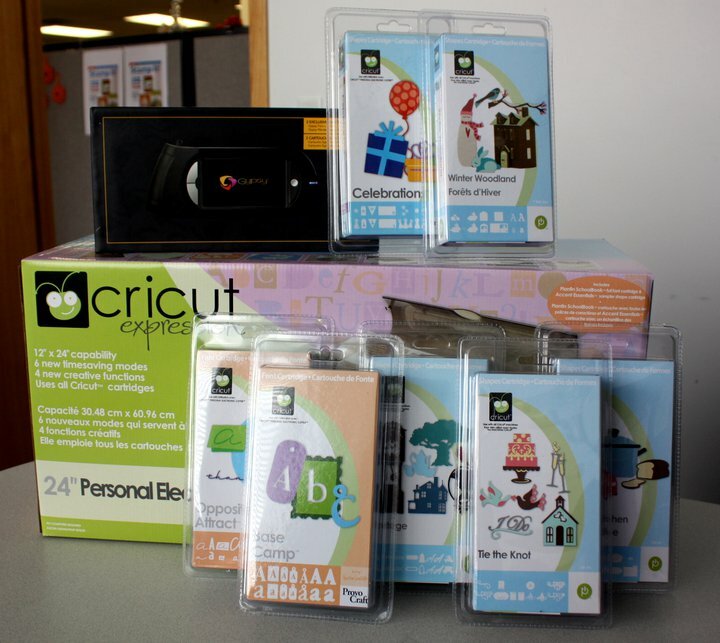 A Cricut Expression, a Gypsy, and SEVEN cartridges!!! And those are AWESOME cartridges...I use Tie the Knot and Winter Woodland all the time...so make SURE that you leave a comment at the Paper Crafts blog too! Wow love this card! So colourful and clever. Gorgeous card! I love that sentiment! Happy birthday too! Mine was yesterday, LOL! First off Happy Birthday!! :) My first time visiting your blog and you are going on my list :) Beautiful card! Beautiful card, love the gems. Fabulous card! Can't wait to get my hands on a copy of the magazine! Thanks for the chance! Gorgeous card, Lea! Love your cover card, too! Happy Birthday! Great card love all the details! Congrats on the cover card. Love your designs and great card on post today. Happy Birthday!! WOWZA...you are definitely rockin' this special issue from the front cover and all throughout...congrats!!!!! Today's card is absolutely fantabulous! Thanks for your never ending inspiration! Happy Birthday ! 15 cards...WOW ! Awesome. Love this card and all the colors ! Happy Birthday. Congratulations for having your card on the cover of the magazine. Happy Birthday. Love the colors, gems and flowers. Great card. Love visiting your blog-so many great ideas! GREAT card. You have a good eye for how to put the colors together. Congrats on that beauty on the cover too. Greta giveaway and I do love your cover card!! This one you share today is just as lovely though! Oh your card is just beautiful! 2. HUGE congrats on the cover, your card is FANTASTIC!!! 3. LOVE this card too, way to rock this color combo!!!! The colors and paper work well together. This is very nice work! Wow, what an awesome prize. I love the card, I can't wait to steal the design...hehe. what vibrant beautiful colors in your card - I love it! Congrats on getting the cover of this awesome issue! The new card is fab too! Congrats and Happy Birthday Lea! Can't wait to get this issue!! Wow, gorgeous card. Love the way you used the color combo. This is my first time visitng your blog and you have some beautiful projects. Thanks for sharing. Oh, Happy Birthday also. It is my granddaughter's birthday too. LOVE the card-so bright and cheerful! I love papercrafts mags and have shelves full of them. Love the brightness! Great job. your card is so pretty, Lea! And congrats on the cover spot! Wow! The recipient of this card is going to feel a whole lot of happy when they open the envelope! Vibrant and joyful! Congratulations on having so many of your creations included in the book! Your card is so bright and sunny. Sure to make anyone feel happy! Oh, very sweet! I would love to recieve a card like this, will make me cry, surely! And such cute little flowers..wonderful work! Happy Birthday Lea!! Have a wonderful day. Congratulations on making the cover of the magazine. I really like your interpretation of your cover card on the blog today. So sweet. Amazing use of these colors! Thanks for the inspiration! Your card is so bright and cheerful! Beautifully done! Hope you have a marvelous Birthday! This is a really fun card! And Happy Birthday! Oh I love this card! Your cover card is gorgeous too! Love the bright, bold colors. It is more striking because you didn't over-embellish it but just let the colors be the design. Beautiful card! I love seeing how each one of you had such different inspiration with these colors! Great card .. using some of my fav CC paper! Thanks for the colour ideas & inspiration! Love the card and the saying ~ Hope you have a great birthday! Love it!!! so bright and cheerful. So pretty. With that verse anyone would be glad to receive the card. LOVE this card and your blog! Congrats on the magazine! Happy Birthday and Congrats to you! I love your cards and use of color. Lea, this is just stunning. I love this color combo and you have intrepreted it wonderfully. Thanks for sharing your talent with the rest of us. Congrats on the cover, and I love your card today...a splash of color on a wintry day! I love your fun, bright and cheerful card! WOW! Thanks for the chance to win. Love your card, it has a bright happy feel to it. tfs. OMG! I really, really like this combination. I have to get these colors together to make something. Love the pink card base and the blue for the sentiment. Striking! Lovin’ how each card brings forth different colors to shine. That’s the beauty of this art. Happy birthday, Lea. Your card rocks! Big congrats for making the cover!!! I love your cover card! Congrats :) This issue just needs to be read over and over and over again, doesn't it? Gorgeous! This would brighten up anyone's day! Love the patterned paper you used in your card...very beautiful! A lucky friend to receive this card. An envelope full of sunshine; it's so vibrant and fun. Best wishes on your special day. Enjoy your birthday! What a beautiful card with great use of the colors. Thanks for sharing! Way to shine girl. Love the cover. Live your cards ( the ones Ive seen so far). Can't emwait to get a copy! And Happy Birthday, hope it's as fabulous as you! Oh, I love your take on the color combo!!! Gorgeous work girlie and Happy Birthday! Love your card..whomever you sent it to will be so happy! Great colorful cards on both the cover and today's version. Fabulous!!! This color combo rocks!!! Congratulations and happy birthay. Your card on the cover pretty much sold the issue to me! Love your hop card too! I love your beautiful card! Funny, the first thing I noticed about it was the great colors! :) Hope you have a very happy birthday! Love your take on this combination! A lovely, bright quilt of color! Love this one AND your cover card! Fun, fun card! Love your color blocking on it. I like how crisp and clean this card is! Congrats to you & a Happy Birthday at that! Amazing card! I love it! The different colored jewels really add to the effect. Thanks for sharing! Congratulations on your success and happy birthday! Thank you for sharing your creativity with all of us. Lea when I was reading this issue I was so happy to see all of your cards... I am so excited for you. Happy Birthday my friend. I hope you have an amazing day. Awesome color combo, super cute card. WOW!! FIFTEEN cards and the cover? Amazing, but I am soooo not surprised, because you have such a flair with color! Congrats!!! Fantastic card! I can't wait to get this publication!!! What a beautiful card. Love this color combo. Beautiful! I love those colors together, and your card has me digging out that same piece of yellow Cosmo paper. This was fascinating! Thank you so much! Love your card with the bling. Such a fun card. I so love your card and this color combo - fab! Your card is great! Fun to see all the different cards on the blogs-thanks for a chance to win. Happy Birthday. Thanks for the inspiration. I'll have to give this color combination a try. This is yet another stunning card! Well done! Your card is too cool. I love it!!! Congrats, Miss Cover Girl! And Hapy Birthday to you, too!! I love the second interpretation of your cover card - the colors just WOW me! Thanks so much for sharing! Happy Birthday! And congrats on being the cover girl!Your second card is as beautiful as your cover card. Thanks so much for sharing and inspiring the rest of us! Happy Birthday! My son's (7th) birthday is today as well. Your cards are gorgeous and I can't wait to try some of your ideas out. What an adorable card. I, too, am in love with this color combo, it just jumps off the page and is so exciting to look at. Lea, hoping your birthday is extra special today!Thanks for sharing all your talents with us. Wow, fabulous design with these bold colours! Congrats on making the cover!! Both of your cards are GORGEOUS!!! And Happy Birthday! an absolute riot of color! just what we need on this gloomy winter day! Such a sweet card and I love that you gave the instructions for how you made it! Happy Birthday :) WOW I love this card!!! I love your cards, they're so cheerful. The jewels really look great. How fun to say you are a cover girl! So deserving too. Happy b-day! Beautiful card! I think jewel tones are my favorite. congrats. I bough the apecial issue and have loved going through it. Each time I flip something else catches my eye. Thanks for the inspiration. Beautiful card creation! Thanks for sharing your ideas. beautiful...i love how its so BRIGHT!!!!! Your card is very pleasing to the eye...Great Job!!! Wow! What a creative use of colors! Great card!!! Happy Birthday, Lea! And Congrats on gracing the cover of this awesome special issue. I can't wait to get my hands on it! Your sample today is so fun and cheerful--love the way you've used the colors (again!). Thanks for sharing! What a wonderful take on the color challenge! Beautiful card! Love the way you combined the colors! Great card, and HAPPY BIRTHDAY! Beautiful card and congrats on the cover!! The colors are so festive & happy. Love it! I need that saying! That is such a great one! Your card really caught my eye with those colors and the flowers are so sweet! love love love your card! its fantastic in every way possible! Love your cards! Great colors and designs. Cute Card! Fun colors! Thanks for giving the instructions as well! I just love all the details, from the jewels to the pattern on the printed paper. Nice job! I love those colors! They make me think of summer and not the 10 inches of snow sitting outside. lol You've made a wonderful card! 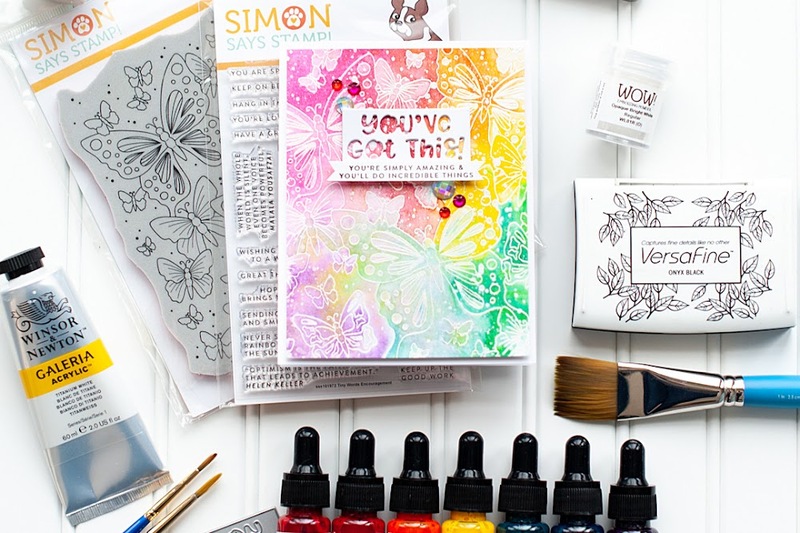 I love the colors of patterned paper you used on your card, I will have to try this. Absolutely GORGEOUS!! Love, love, love this card, Lea! I wished you a happy birthday on FB, but since I'm here... HAPPY BIRTHDAY!! :) Hope you have an awesome day! 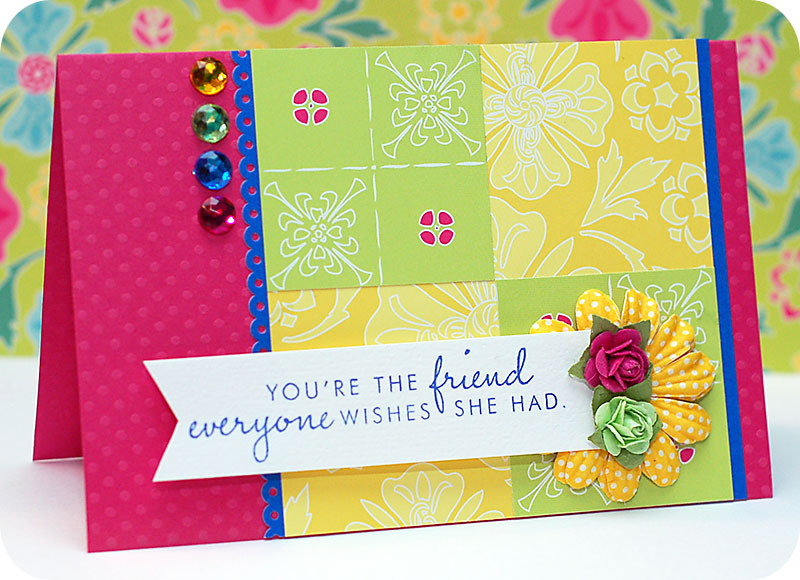 Love the patterned papers, rhinestones, flowers and lovely sentiment on your beautiful card! While blue is my favorite color, this card with the pink base is the BOMB! I love it. Great job! This is so exciting! Wow! What a bright and upbeat card! The placement of your accents really catches my attention. I love the little flowers on top of the larger one to the right of the sentiment. :) Terrific work! Wow, I am amazed by your work ...been to several blogs today for the contest...SO INSPIRED...I love the Freind card...and so much more...I could BLOG all about it right here, but I won't! Thanks so much for sharing!!! I hope to be back soon! Awesome cheerful card!! I adore this paper line from CC and you did an excellent job with it! I loved your card so much I saved it to my inspiration folder! I especially love the sentiment! Great card! Love the color combo. Love your card! Thank you for sharing and for the ideas! Those flowers are great! Love your card. I'm a latina and I really like brighter colors. Love card! Really the two different looks between the cover card and this one! Beautiful, bright card. Thanks for sharing the steps of creating it with us. I love the jewels that you used on this card. The blue and pink look awesome next to each other. Sweet card with so many patterns and details! love the card - I'm going to try this one. Love the jewel/bling. The colors are fabulous. Great job! Love this card and such a happy design!! I love this color combination and what you did with it! I have been trying colors that take me out of my comfort zone. I love pastels and neutrals. I just picked up this issue and if I win a copy will pass it on to my sister-in-law. I'm at a loss for words ... I love the way you did the blocks! this is sooooo pretty and has become my inspiration for the birthday card I'm agonizing over! I must say that I like the card on the cover best. I love the colours in the challenge so much! You really have a talent with embracing color challenges. This card is truly awesome. Oh, what a lovely card! I really like the different papers you used for the background. Super cute! both of your cards just pop! they are filled with joy and light. Oh my, think this one is my favourite! I love it! Beautiful, a masterpiece! What a bright and happy card! I love it! I love the brightness of your card!!! Lea-I don't think there was one card in Color Inspirations that I did not love that you created. Congrats on being the covergirl and Happy Birthday! Happy Birthday, Lea! I hope you're having an awesome day! I celebrating your birthday by blog-hopping! I think it's a good way to spend part of the day! 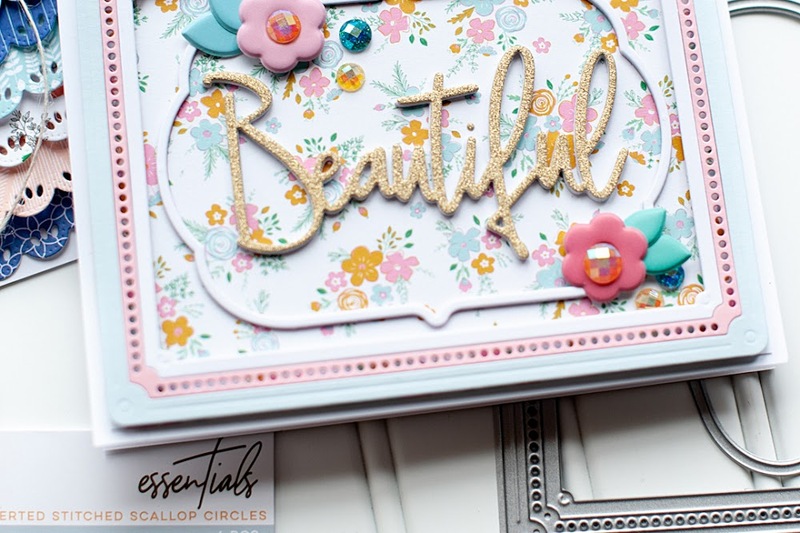 I love your card...both the cover card and the one here on the blog! Love and talent abound! Such a beautiful card. I'm loving these colors! Nice work!!! I like the bling.